Here’s a look at Tazo Tea, their various offerings, their commitment to communities and being responsible, and some links to help you learn more. This is Tazo Tea’s old logo, which has since been updated with something a little crisper and more modern looking. Tazo is the first tea brand that comes to mind for many people, whether it’s because of their prevalence in grocery stores across the world, or because of their famous parent company, Starbucks, who also owns tea company Teavana. 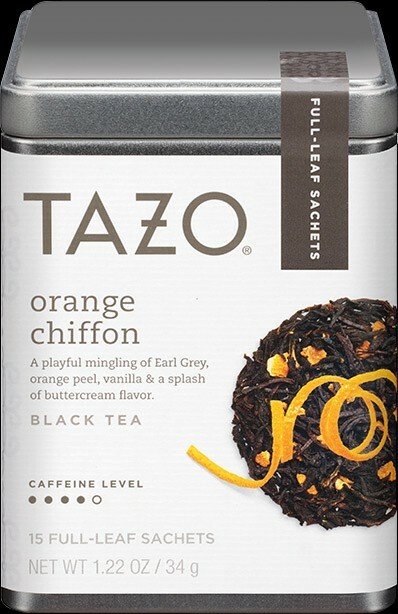 Tazo originated in Portland, Oregon in 1994 and moved under the world-renowned coffee company’s umbrella in 1998. It shares a founder with tea company Stash, which was Steven Smith’s first endeavor into specialty teas. Starbucks reported that tea as a whole is 10 percent of Starbucks’ U.S. retail sales and tea drinking continues to grow in popularity in the United States. Tazo begins with quality tea selected during trips to more than 35 origin countries. Tazo only buys unblended teas, allowing their master crafters to have greater control over the final product. The taste is largely determined by a tea’s origin geographic location and climate and is also influenced by local agriculture practices. The tea leaves are blended with herbs, spices, and botanicals to create the desired flavor. Blending tea with multiple ingredients is an integral part of the process, as it allows Tazo to create signature blends with unique but consistent flavors. To ensure consistency, Tazo tea is tasted up to seven times before it reaches stores. Believing that each cup tells a story, Tazo breaks their family of teas into five flavor categories: spicy, sweet, fruity, floral, and savory. These categories feature seven tea types, which include black, green, herbal, chai, white, decaf, and organic. Most come in bags or sachets, with some varieties packaged as K-Cup pods or as concentrate in cartons. However, Tazo uses unique terminology, referring to tea bags as filter bags and sachets full leaf tea. They also sell bottled varieties of some of their best-selling blends. The spicy blends are described as fiery, masala, and warm. They include flavors like ginger, mint, chai, and cinnamon. Featuring a few of the same flavors, the sweet blends are described as creamy, cinnamon-y, and chocolate-y. In this bunch you’ll find your vanillas, and you guessed it, cinnamons and chocolates. Orange, peach, and other berry and citrus varieties describe the fruity blends, which are defined as citrusy, jammy, juicy, and tangy. Rounding out the sweeter teas are those with hints of floral, best put as delicate and fragrant, and featuring chamomile, jasmine, and rose petals. The savory teas are reminiscent of many of the other refreshing, bold flavors like mint, earl grey, and cucumber. These are described as minty, malty, and vegetal. When you’re ready to try any number of products from Tazo’s product line, you’re most likely to find them at your local grocery or convenience store, inside Starbucks, or at a number of online retailers. Want to ride the line between loose leaf tea and bagged tea? Empty tea bags might be the perfect solution! Their most popular blends include Awake English Breakfast, Refresh Mint, Chai Tea Latte, Zen, Earl Grey, and Passion. Awake English Breakfast is a mix of black teas that is malty and bold. The Chai Tea Latte features black tea with cinnamon, ginger, cardamom, and vanilla, making it both sweet and spicy. Zen is a green tea with notes of spearmint, lemongrass, and lemon verbena leaves. Passion’s flavor profile is built with hibiscus flower, orange, rose hips, and licorice root, making it sweet and nutty. Tazo works to leave a lasting impact on the communities they visit around the world. In conjunction with Mery Corps, a nonprofit organization, Tazo has impacted over 200 tea and cardamom producing communities in Assam and Darjeeling, Indiana and Alta Verapaz, Guatemala. Their efforts are focused mainly on healthier communities, youth empowerment, and economic opportunities. Statistics have shown that Tazo and Mercy Corps’ efforts have improved hygiene practices and reduced disease. Take time to learn a little more about Tazo teas before your next trip to Starbucks. Your barista will thank you. You can find Tazo online at tazo.com or connect with them on Facebook, Twitter, Instagram, or Pinterest.